Going far back into the last century, and beyond a little bit, it is interesting to see what kind of prices existed for things the Basin fishermen sold and bought. Some of the prices received for things like fish and moss were low, as expected, but then so were the prices of much of the m aterial they needed to buy. Catfish in 1900 were bringing 5¢ to 8¢ a pound, while the other saleable item, dried moss, brought 1.5¢ a pound. This provided the primary income for families in the swamp that were harvesting Basin resources. The other source of income was work in the timber industry. In the early 1920s and 19 teens, men cut timber for 50¢ a day. By 1932 the wage was up to $1.50 a day for deadening cypress, and presumably the other jobs that people did in that industry were similar. The income from selling fish dropped for most people during the Depression (~ 1930 to 1942) from about 8¢ a pound to 3¢. There are occasional reports of eight and even 10¢ but not many. 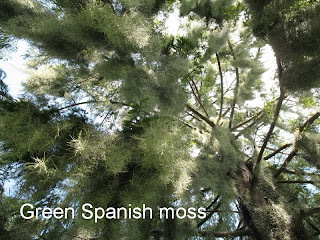 Moss seems to have increased in value somewhat before 1930, but following the trend in those years, seems to have dropped from 3¢ to 1¢ a pound during those economically stressful times. When World War II began, it signaled the end of the Depression, and prices began to rise. In 1944, catfish were bringing pre-Depression prices of about 10¢ a pound in most docks, as dated from the statement that follows (using the memories of births in a family). EJ Daigle remembers his father fishing about that time. And by 1949, prices of fish had risen to an all-time high. Russell Daigle testifies to this. The fishboat added value to the fish they bought by assuming the responsibility for delivering the fish from the fishermen to the dock for processing and shipping. For this service they added a certain amount per pound to what they paid the fishermen. The amount they made per pound when the fish were delivered to the dock varied with the period discussed but seems to have been from 3¢ to 5¢ a pound. 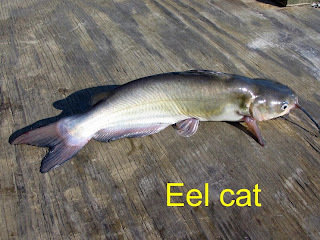 An interesting anomaly took place somewhere around 1959 when the two species of catfish (the blue and channel, aka eel cat) were separated with respect to value. 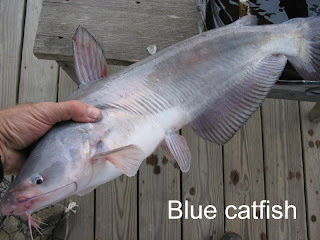 Instead of being considered together, for some reason blue catfish were valued at a higher rate than channel catfish. 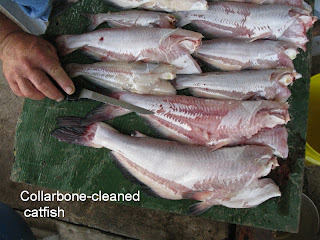 Overabundance of channel catfish may have been the answer to this, described as a glut by fishermen. This artificial separation of the species soon ended, and the price of both species of catfish gradually settled at about 25¢ per pound. That’s rough fish, as caught, not filleted or collarbone cleaned, but as caught. That price remained until 1974, when the fishermen united in an attempt to form a buying a nd processing cooperative for fish caught in the Atchafalaya Basin. It was during the time that this venture was in the process of development that the docks doubled the price to the fishermen - from 25¢ to 50¢ a pound. This was the first time the price had been that high since 1949. That price remains to this day – 50¢ a pound. For unanticipated competitive reasons, the fishermen’s cooperative only progressed to the advanced planning stage. LC: [. . .] We wasn’t in debt. Didn’t owe nobody. EC: You could live on $25 a week. Live good too! Even though it was a seasonal activity, trapping could be a big part of the income for Basin people. Muskrats were the foundation of trapping, especially along the coast, but the coming of nutria was a big boost, temporarily at least. It took only a few years for this artificially introduced mammal to reproduce into harvestable numbers, and by 1946 it had spread from coastal marshes to the Basin and was just then being harvested there for the first time. 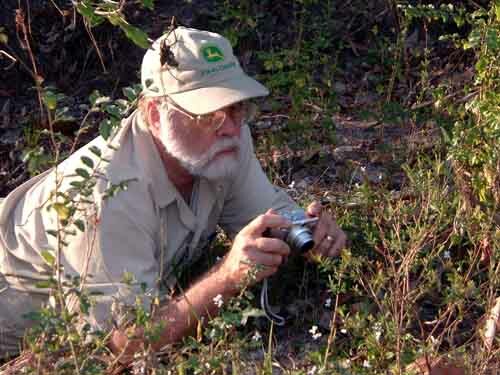 Russell Daigle was one of the first to catch nutria in the Basin and had these memories. RD: On the end of the bars, when the end of the bars got about even with, uh, the lower end of Goat Island. They were trappin them bars out there. And uh, we caught a neutral [nutria]. And from then on it’s started showin up thick, they comin from up north, I guess. JD: Yall didn’t know what to do with em? RD: No, come to find out they were worth good money. We get about $7.00 a piece for em. They were worth real good money! Them days, look, $7.00 a lot of money. You go catch seven, eight a day? Made a big year there, with them neutrals. [laughs]. Some of the other items for which there is a record of prices paid or the cost of purchasing are also part o f the interview material contributed by the Myette Point families. Freshwater crabs were sold to the processing factories in Morgan City for 3¢ a pound in 1945. Flour cost 40¢ a sack. Gasoline 20¢ a gallon. In 1940 they sold a pair of mallard ducks for 50¢. 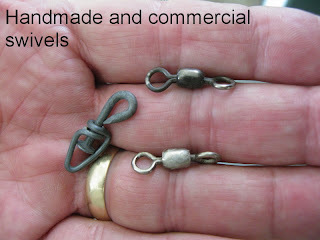 They could handmake durable swivels out of a nail and a piece of wire to sell to other fishermen for $1.25 a hundred. They could make ½ inch-mesh shrimp dipnets for $1.50 each. Bullfrogs and pigfrogs were caught in the Basin in large numbers but there was no market for them in the 1930s. Being able to live on houseboats and gain income from fishing, and also carry the responsibility for owning property was sometimes not possible, or desired. Taxes on property, often the property that had been settled by the same individuals who moved permanently onto houseboats, were not regarded as serious issues by many people, and so their lands were forfeited to the legal process. Myon Bailey and his wife Agnes talk about their relationship to taxes and property. MB: [. . .] Fourmile Bayou, a lawyer come and see me one time, about taxes, said nobody ain’t payin taxes. Say if yall don’t pay the taxes …ain’t gone be yours. So I paid the taxes that year [~1950], and that’s it, I didn’t pay it no more. Years ago, when we first moved at Myette Pt. On the bank . MB: I never did pay it no more , and it was only $3.90 a year. JD: How much property was involved? MB: Nineteen acres. It’s a oil company come and see me. They want to lease it. So, during the Basin houseboat years, from 1900 to about 1950, line fishermen didn’t have large incomes, but they didn’t have large expenses either. During the time when catfish brought 10¢ a pound to the fishermen, they could achieve the desired $5.00 a day with 50 pounds of catfish. Fishing for the big goujons could bring that with one fish. Earlier prices of 3¢ might bring less income, but that was at a time when expenses were less too. All in all, people could make a good living linefishing in the Atchafalaya Basin during the houseboat years and thereafter until the 1980s. After that, competition from farm-raised fish reduced the market for wild catfish to the extent that linefishing for them was no longer worthwhile in Grand Lake. Except for those caught by a few netfishermen, the docks have almost quit buying wild catfish from the Grand Lake area. For the most part, because of the competition with the more uniformly-sized pond catfish, only small fish are bought now and those in amounts insufficient to support a linefisherman and his family. And the price to the fisherman that was elevated to 50¢ a pound in 1974 is still that, or less, for wild catfish. The river is at 11.5 feet on the Butte La Rose gauge, falling slowly to 10.5 by next Friday, and probably falling after that. The Mississippi and Ohio are both falling all the way up.